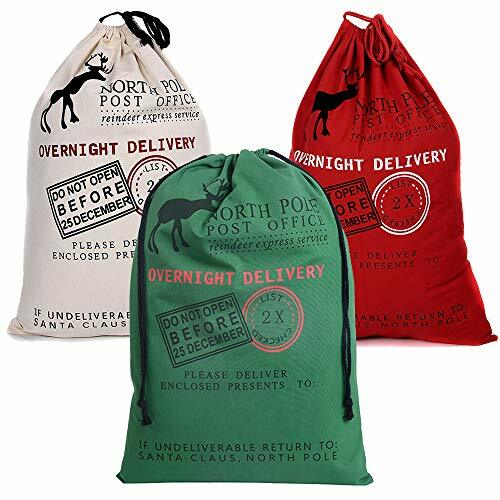 Personalise it with the name of the lucky recipient,you can hand write or embroider in large space of the bag,Ideal for wrapping Christmas presents to children of all ages or your friends, it is a great surprise! HEAVY DUTY CANVAS: Made of heavy duty canvas, durable eco-friendly and safe to contact with skin or food. CHRISTMAS MUST-HAVE: Your little ones will be overcome with joy and excitement when they see that their presents have arrived straight from the North Pole! FASHION AND UNIQUE DESIGN :Holds all kind of Christmas gifts, from presents to candies, and clothes to toys，max loading 110 LB，Ideal for wrapping Christmas presents to children of all ages or your friends, it is a great surprise!